Designing buildings which generate renewable energy equal to the amount being consumed by the building is an example where zero is the goal. A number of small mostly residential structures have successfully achieved this goal and are known as Zero Net Energy Buildings (ZNEB). The challenge becomes greater as the size and program complexity of the building increases. And when a building is developed within the public sector and requires competitive construction bids, it gets even more challenging. North Shore Community College (NSCC) under the umbrella of its public development agency, the Department of Capital Asset Management (DCAM), set this goal with a demonstration project to test what could be achieved within the budget and current technology. 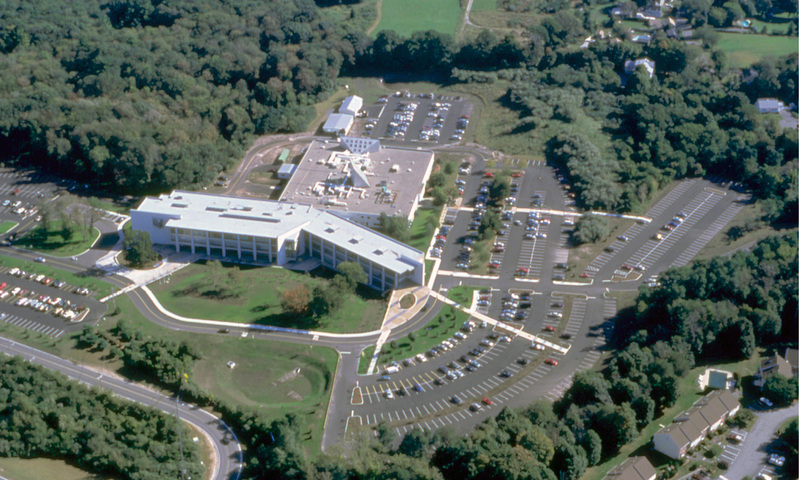 Having years earlier completed the first new building at the Danvers campus, which reoriented the entry approach and concealed the existing one story warehouse academic building, we were fortunate in 2006 to be hired by DCAM to conduct a planning study for NSCC to consolidate the College’s health professions programs. These disciplines were divided between NSCC’s main campus and the adjacent former campus of the Essex Agricultural School. The desire was a new building containing classrooms and laboratory spaces dedicated to courses in nursing, physical and occupational therapy, radiology, respiratory and surgical care, and animal science. Accommodating the academic needs of the college was critical to NSCC President Wayne Burton, but he also had a bigger vision. “As an educational institution, we have an obligation to be a regional leader in many ways, and one is to make sure that we teach our students by example, such as by how we are actually behaving. So when we urge them to think about conserving our resources, we have to be doing the same thing.” Burton challenged the design team to design a ZNE Building and committed himself to do whatever he could to obtain financial support from the State to ensure that NSCC’s new Health Professions/Student Services Building would become the Commonwealth’s first project reaching Zero Net Energy. Most “first” achievements get several strategic or “lucky breaks”. 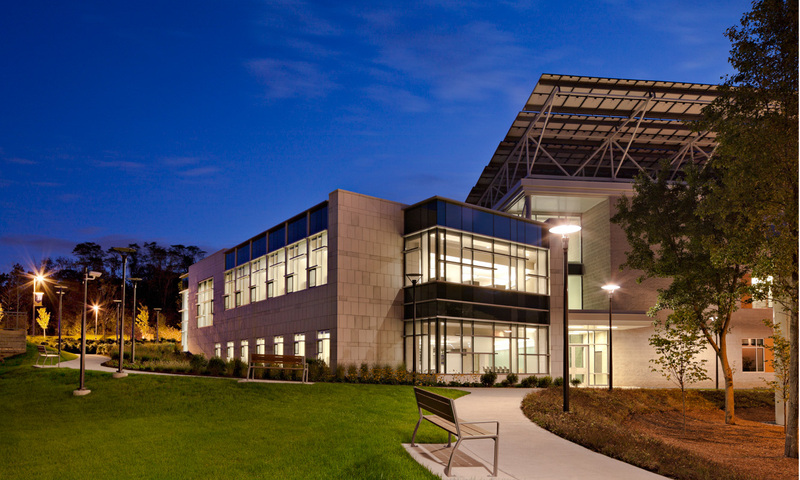 As the design of the Health Professions/Student Services Building was progressing, Governor Deval Patrick, along with the Massachusetts State Department of Energy (DOE), was promoting green building construction and looking for an opportunity to develop the State’s first zero net energy building. Peter Fourtounis, Senior Associate of the firm, served on the Governor’s Massachusetts Zero Net Energy Buildings Task Force Working Group and nominated the NSCC project to be selected as a demonstration project. The Governor’s Council on Sustainability ultimately selected three model projects: North Shore Community College Health Sciences Building, the Division of Fisheries and Wildlife Headquarters, and the Lowell Trial Court. Within DCAM’s project budget of approximately $24 million, the design of the new building had to meet all of the College’s programmatic requirements while also incorporating as many design elements and systems that would achieve LEED Gold. 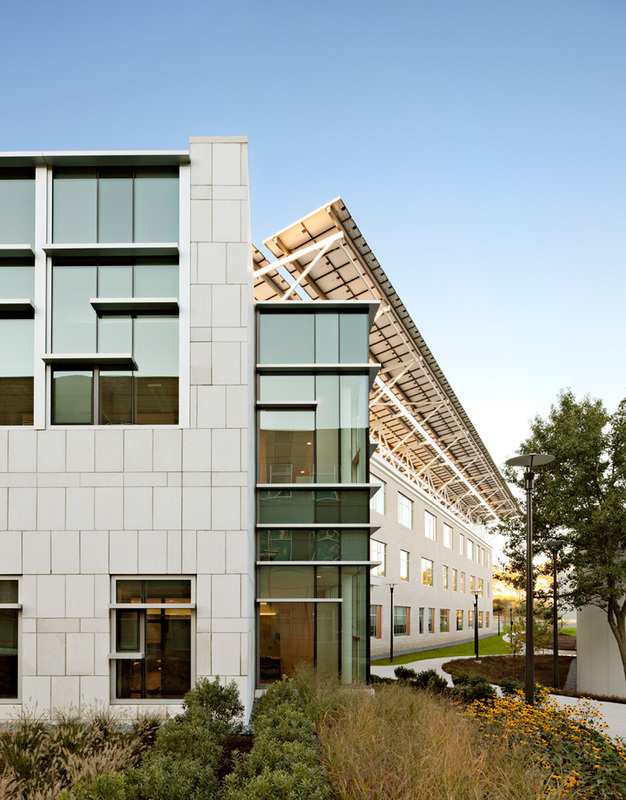 The building program came to slightly less than 60,000 square feet and while a LEED Gold building was within reach, a ZNE building would require additional funding. Design progressed with the understanding that the availability of this money might not be known until after construction drawings were completed and the public bidding was complete and evaluated. The key to planning for zero net energy is to first reduce the loads to the absolute practical minimum before exploring generation sources. One of the most effective approaches is to minimize the heating and cooling loads within the building. The design team studied the options for the building’s orientation to the sun, the effectiveness of the insulation on the exterior enclosure, and alternative mechanical and electrical building systems. In order to minimize even further the energy consumption, the design team also needed the commitment from the College to request only electrical power sufficient to operate electrical equipment that was crucial to the learning/teaching experience. The design team recommended foregoing the typical “energy contingency cushion” often included as part of a traditional programming process. We will later see that this was too optimistic an approach. Since artificial lighting and the cooling energy to compensate for its generated heat can often represent 35-40% of a building’s total energy consumption, time was spent to capitalize on the benefits of “free” daylight. Optimizing daylight resulted in significant energy savings especially when combined with dimming controls. 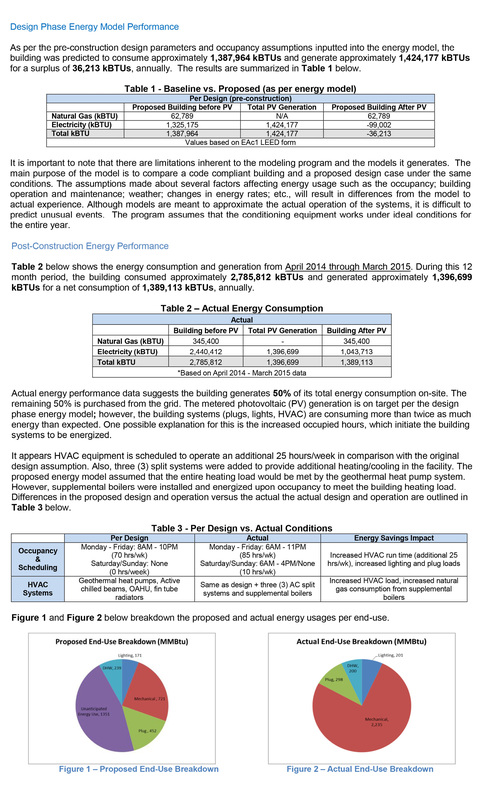 Energy modeling also demonstrated that the savings achieved by using daylight instead of artificial lighting far outweighed the savings from a reduction in window area or enhanced glass performance. The shape and positioning of the proposed building was carefully studied to maximize the utilization of daylight. The rectangular building, with its long axis running in the east-west direction, maximized the length of the south façade which most benefits from the rays of the sun and is the easiest to control. 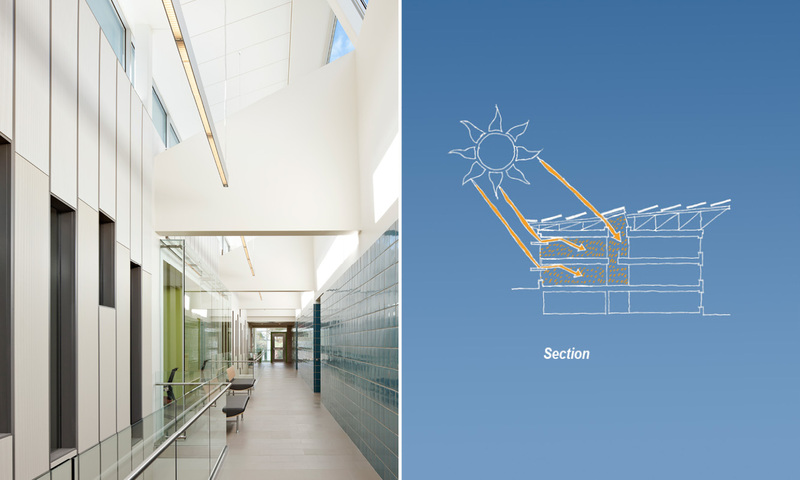 To bring daylight deeper into the building, the design incorporates a continuous clerestory in the roof that directs glare-free sunlight into the third floor main corridor and then down through floor openings, illuminating the second floor corridor below. Internal offices and conference rooms lining these corridors are glazed to benefit from “shared” daylight. Classrooms and offices facing south are protected from direct sunlight and glare by a combination of external and internal light shelves that shade and redirect sunlight coming through the windows. These light shelves improve occupant comfort by controlling glare and reducing the contrast on interior surfaces. They also bounce light deeper into the space, increasing daylight effectiveness by a factor of two when compared to windows without light shelves. The electrical lighting within the classrooms and larger office areas was sequenced in zones parallel to the exterior wall so that lights are automatically dimmed by sensors in response to available daylight levels which vary throughout the day. Vacancy sensors also automatically turn off lights when the rooms are unoccupied. The combined use of these automated sensors reduced the electrical load and resulted in savings in the 20-25% range over buildings without such controls. There is a delicate balance between designing a building with lots of windows and minimizing the heat gain/loss through those same openings. For example, the computer model determined that the roof-top clerestory significantly reduced the lighting loads which would have been necessary to artificially illuminate the second and third floor corridors. Even though this additional glass lowered the total insulation value for the roof, the electricity required to provide artificial lighting without a clerestory far exceeded the energy needed to offset the added heat gain/loss through the glass. The building envelope is well insulated, achieving R-values of 45 for roof and 20 for walls. Similar to the analysis of the roof, computer modeling tested options for the window/wall ratio, recommending a balance between a well insulated opaque exterior building wall (approximately 59%) and a transparent/translucent glazed openings (approximately 41%). Maximizing the daylight along with the automated light controls held the lighting load to only 15% of the total load, compared to 35% for a typical building. In keeping with President Burton’s challenge to reduce the College’s dependence on fossil fuels and create a true building demonstration project, a geothermal heat pump coupled with a chilled beam system was selected to heat and cool the building. This technology which uses the temperature of the earth, instead of fossil fuels for heating and cooling, has been successfully employed in Europe for the past 15 years. Consideration was initially given to utilizing a conventional boiler/cooling tower as an approach for the emergency back-up system. However, it was determined that if the number of geothermal wells could be increased by 15% to a total of 50 wells each at a depth of 500 feet, the emergency back-up and redundancy could be created without the need for reliance on fossil fuels. While the building envelope and mechanical/electrical/plumbing (MEP) systems can be designed to be as energy efficient as possible after minimizing the loads, a critical challenge in a ZNEB is developing and incorporating into the architectural solution an on-site means of producing renewable energy. 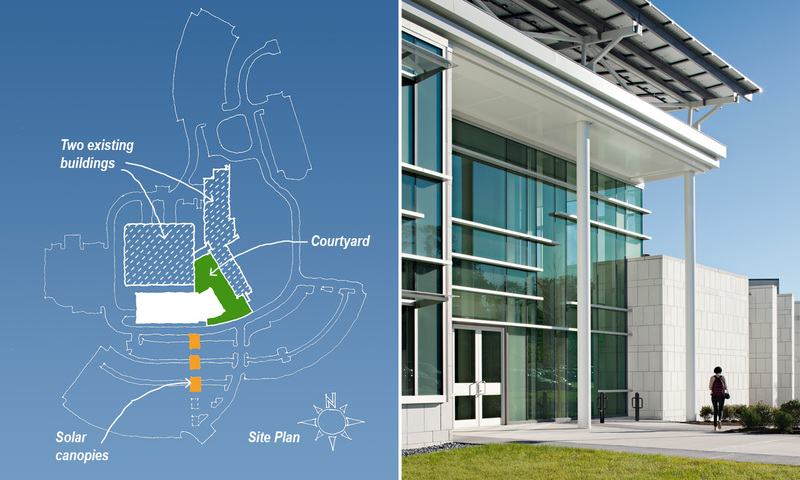 With limited land area, the most viable option for NSCC was to explore electrical generation using photovoltaic (PV) cells located on the building’s roof. Energy modeling consultants, Buro Happold Consulting Engineers and Solar Design Associates, confirmed that roof mounted PV panels would yield the highest production of electricity if properly tilted towards the sun with minimal shadows cast on the photovoltaic surfaces. It was also understood that these panels would only be considered if the State decided to adequately support this demonstration effort with an additional $2 million in funding. The exterior and interior of the building had to appear finished and fully designed whether or not the additional grant money came through from the State to achieve a ZNEB. We concluded that the only reasonable approach to this design/financing problem was to treat the rooftop photovoltaic design as an “additive” element to the building’s design which would be visually successful regardless of the ultimate financing outcome. The design modeling concluded that a 340kw photovoltaic (PV) system would be required to meet the zero net energy goal. And using the most efficient panels then available on the market (SunPower’s E19 series 318W) would require 1,088 such panels, installed at the slopes and orientation established by the preliminary design. In 2011, when this project was constructed, manufacturers of solar photovoltaic systems produced PV panels rated at 250-320 watts of electricity per panel, with a range of efficiency from 7% to 18% in converting sunlight to electricity. Somewhere between 1000 and 1100 panels would be required to achieve the target depending on the panel. The roof of the building alone did not provide enough area for all the panels so it became necessary to develop a flexible design solution to accommodate each of the three pre-qualified bidders whose panels varied in their output efficiency. The final design solution provided a roof truss overhanging the building on the north side minimizing shadow impacts. The trusses were built with a 7 degree top chord tilt with panels mounted on a purlin system set on the top chord of the truss at a 2 degree angle for a total of 9 degrees tilt from the horizontal. 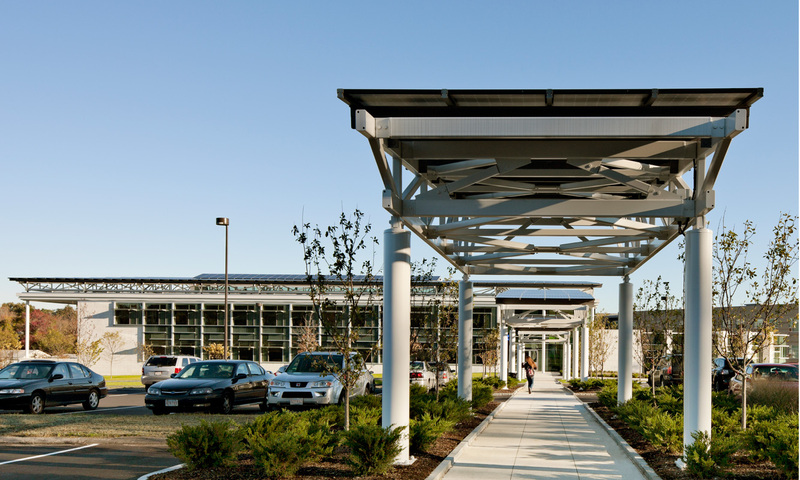 Between three and five ground-mounted steel canopy structures located in the parking lot to identify the primary pedestrian path allowed for an increase in the total number of solar panels to fulfill the electrical performance requirements from the least efficient panels. After the bids were analyzed it was determined that SunPower had proposed the most economical solution for project utilizing just three site canopies. It has often been said that most every building is a prototype: the first time a particular program is put together in a specific way on a given site. Thousands of different products are installed by hundreds of workers in unique ways as the first of its type, likely not to ever be repeated again. This is especially true in designing for the ZNE building frontier because you are also pushing the technology and comparing it to a computer model based upon inputs such as weather data that change over time. While there are some anomalies noted during the time period covered in this report, we have learned a few lessons. It is necessary to install as many meters as things you want to monitor because it is hard to tell where the energy is going if you only have one meter. Programming needs tend to expand, so the fact that this building is in use for at least 25 hours a week more than anticipated has a big impact. I have heard that this is an issue for other buildings attempting to reach net zero performance. Two aggressive decisions we made regarding the energy loads did not hold up. One being the elimination of the “energy cushion” for plug loads and the other was trying to get the emergency backup heat out of the ground source heat pumps without resorting to boilers. It was exciting to be involved in a project that pushed the envelope and better informed our efforts moving forward as signers of the AIA’s 2030 Challenge to reduce the carbon footprint of our new buildings and significant renovations to zero by 2030. So zero is still the goal.